Of course Cybergrrrrrrrrls get to cheat a little on the clothing stakes, but this lady can only be suffering under all that backcomb. 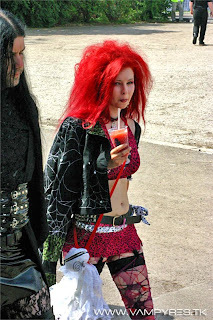 Fortunately a plastic cup of Snakebite & Black saves this young lady's day. Sorry hang on... is the GUY on the left wearing lace stockings? i wouldnt say this girl is cyber, more industrial. if she were cyber her hair would be full of plastic tubes and fake dreads! She doesn't look goth to me. Cyber girl, definitely. I like her style. Have to agree with Sakara, definatly not a cyber look, but i'd say it was more a deathrock look than industrial. and yes cross dressing is common but thats not crossdressing even though theres lace stockings pvc miniskirt and corset being worn there...theres a fine line difference.